Most of Orange’s historic downtown buildings have been remodeled at least once or twice over the years—some more than others. But this one actually grew. The structure is the Armor Building at the southwest corner of West Chapman and the Plaza Square. Sam Armor, our first County Supervisor and later Mayor of Orange, built the building in 1888 as a new home for his shoe and stationery store. (The flat columns on either side of the windows, dated 1888, will hopefully survive the latest remodel.) Armor retired from business at the end of 1901 and sold the building for $3,000 to a recent arrival in town, Lewis Ainsworth. In 1907, Ainsworth remodeled and expanded the building, tripling its footprint and adding an entire second story to create the building we know today. 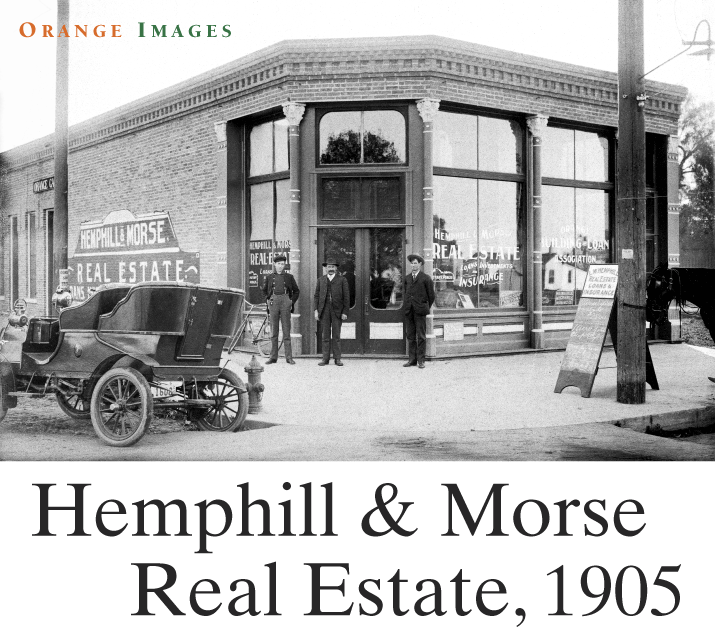 Hemphill & Morse real estate moved in on the corner around the start of 1905. Charles Morse was from Santa Ana and does not seem to have stayed with the firm for very long. He is presumably the gentleman with the mustache in the center and not the unidentified young buck on the left with his hands deep in his pockets. On the right is Lawrence Hemphill (1874-1938), who grew up in Orange (Mrs. Sam Armor was one of his teachers, in fact) and sold real estate here for a number of years. He sold homes, lots and acreage and helped promote several residential subdivisions, including the Nutwood Tract. He also served on the Orange City Council from 1919 to 1924. The painted sign on the east wall (left) is especially interesting since the remains of its twin were uncovered recently during the remodel of the building for the Urth Caffé on what would have been the western (outside) wall until the building was expanded in 1907. Hemphill & Morse weren’t the only tenants of the Ainsworth Building at the time, as the other name on the windows shows. Around the corner, at 106 W. Chapman, were the offices of the Orange Building & Loan Association, an important local financial institution for almost a century (later residents will remember it as Orange Savings). Also of local interest is the automobile on the left, which belonged to Hemphill. It looks to be a 1904 Tourist Runabout, probably with just a two-cylinder engine. Notice the extra door in the rear and right-hand drive, to boot! The Tourist was the first production car manufactured on the West Coast, built in Los Angeles from 1902 to 1910. What’s the local connection? William H. Burnham, the president of the company, lived in Orange at the time, where he was a noted rancher, investor, banker and businessman. The Sisters of St. Joseph now occupy the site of his old home. There’s always lots to see when you look into historic photos.